The amount of things we accumulate over the course of our lives is staggering. Sometimes after moving or renovating, when we’ve been forced to reorganize or rethink the space we have in our homes, it’s truly mind blowing just how many things we cram into this nook and that cranny. Often, such realizations force us to look for third party storage options and we inevitably end up renting a storage unit to house items we no longer want in the house. But storage units can become cluttered and mismanaged. Here are the 5 best way to utilize your self-storage space. Invest in Pallets. Pallets not only allow you to organize things using a convenient and efficient grid system, but they elevate your belongings off the ground and out of the reach of potential water damage, whether from snow melt, intense rain, or from the doomsday water supplies leaking out of your neighbor’s unit. Label everything. Just because you think you have everything inventoried as it’s going into your new storage unit, does not mean that in 6 months-time, when you start needing the things you’ve stored, you are going to remember the mental map you had when they went in. Label boxes and containers so you can quickly and conveniently find what you need, when you need it. Maximize your floor and vertical space. Seems like it would go without saying, but as with many things, sometimes it’s easier said than done. Your standard personal storage unit is not a big space. Utilizing the space you do have, from the floor to the ceiling, is paramount. When stacking upwards, bring some sheets of plywood to stabilize your new layers and take pressure off of the ones below. Box everything. A self-storage unit offers added, but not unlimited protection. These are not hermetically sealed spaces so anything you leave out can and probably will get dusty and dirty. Cardboard boxes are inexpensive and go a long way to protecting your belongings. Dismantle that which can be dismantled. Although the thought of having to reassemble something that took a frustratingly long time to assemble in the first place might seem loathsome, the amount of space you will save in your storage unit if you do so will surprise you. If you are storing furniture, it is going to take up the majority of your space (and fast), so break it down and leave room for everything else. Renting a self-storage unit is a great way to free up space in your home or office but there needs to me method to the madness if you are going to get the most out of it. Simply clearing clutter out of your home and creating it in your new storage space is counter-productive. 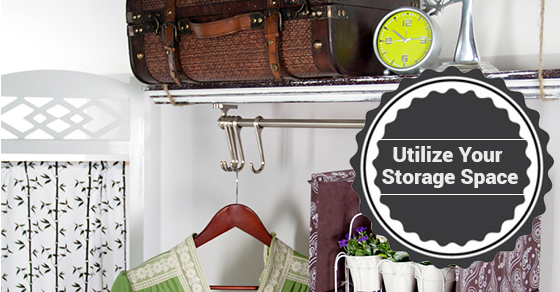 Take into consideration the above five tips and ensure that your items are stored efficiently and safely.